Edgar Cantero, Barcelonean writer and cartoonist. The Supernatural Enhancements is his first novel published in English. An English college student inherits a Gothic mansion in Virginia from a relative he never knew he had. Hijinks of the ghostly persuasion ensue. The Quick by Lauren Owen, and just about anything by Shirley Jackson. A young, sarcastic man known only as A., and Niamh, a mute teenager from Dublin. Nicholas Hoult for A., and Saorise Ronan for Niamh. For this novel, that’s kind of a loaded question. Despite Axton House’s…unsettling history, I think I would have to say yes, if only for the fact that the mansion comes with its own labyrinth. Assuming that the reach of the human mind is still unknown, a man causing lights to flicker with his mind, even unconsciously, is still more plausible than a deceased man’s mind causing the same effect. 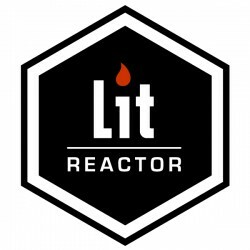 I’m just going to go ahead and say that this was one of my favorite books to review so far this year. Spirits, ciphers, secret societies, and some funky pseudoscience involving the dangers of dreams make The Supernatural Enhancements a fun and addictive read. Cantero takes a risk with a unique storytelling approach, rolling out the mystery of Axton House slowly through a series of external documents. These include a combination of Niamh’s notes (since she is mute, she writes everything down), surveillance video, excerpts from cryptography books, private letters, and more. This gives Supernatural Enhancements a hint of a Blair Witch feel— especially since it takes place in the '90s— but there’s something to be said for the ingenuity of writing a ghost story through EVP (electronic voice phenomenon) recordings. This seems as good a place as any to issue a moderate warning: Supernatural Enhancements is essentially a series of connected puzzles with a plot. Every few pages or so contain a cryptic note, a code to be cracked, or a maze to solve in straight up back-of-the-cereal-box style. Readers who enjoy a healthy dose of esoteric symbolism in their mysteries will likely enjoy the challenge, but others may find the numerous charts and articles rather tedious (anecdotally, I fall firmly in the first camp). 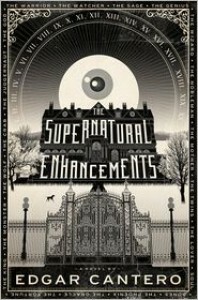 Supernatural Enhancements begins when A. inherits a Gothic mansion from his long-lost cousin, Ambrose Wells. It seems that the Wells family has been following a mysterious trend— both Ambrose and his father committed suicide during the same year of their lives by jumping out a window. Shortly after A. settles in (he adjusts to his newfound wealth quite quickly) a series of vivid dreams begin. As the bizarre dreams grow in intensity and frequency, A. and Niamh work hurriedly to unravel the meaning behind Ambrose’s death, and the strange society he appeared to be a key member of. A. has a surprisingly wry sense of humor that stands out against the classic horror context, and it pairs well with the Niamh’s punk fearlessness. Niamh, an Irish orphan who wears her hair in several variations of mohawk and was taught to play piano by nuns, is a thoroughly likeable character. She’s quite well-defined for someone who is only able to communicate through a series of notes; Cantero still manages to infuse her short correspondences with a distinct personality. I can confidently assert that Supernatural Enhancements would make an excellent companion on a camping trip or weeklong cabin stay, read by candlelight beneath the covers.